Are you bored of playing against opponents much weaker than you? 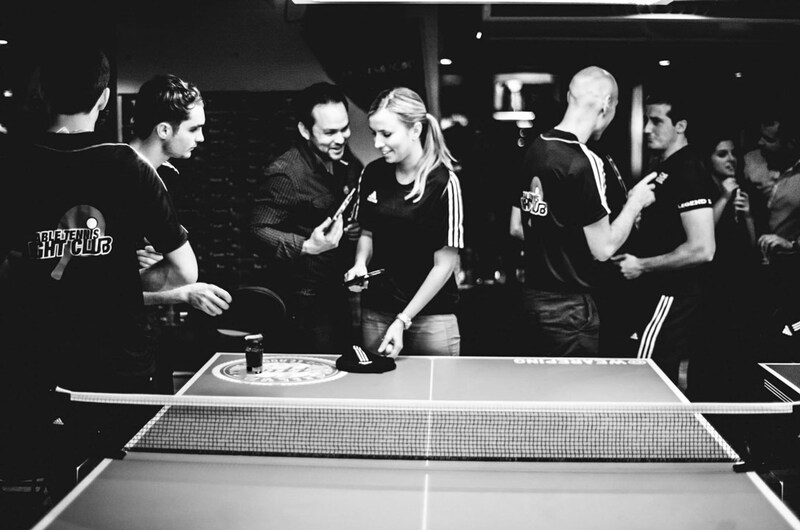 Do you want to meet cool people who share your passion for table tennis? 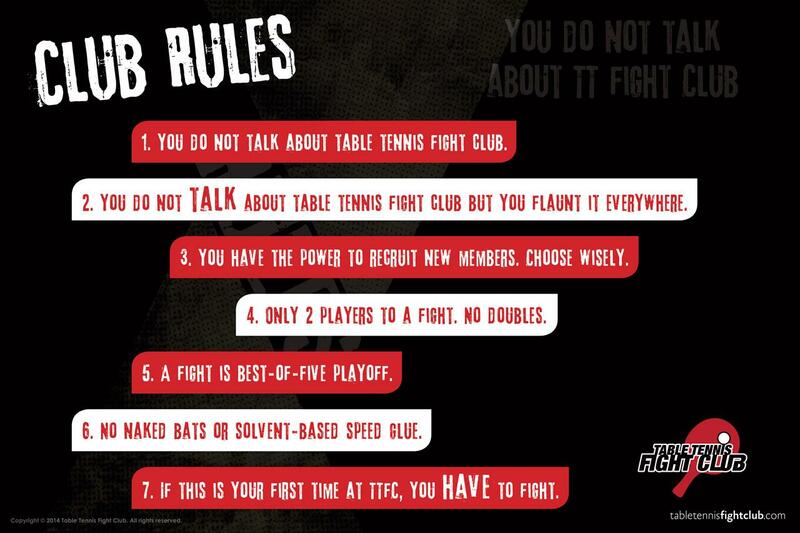 Table Tennis Fight Club (TTFC) is an exclusive club where existing members recommend other players, forming a select membership of high-level participants who meet in secret locations to train and ‘fight’. New players who are not members are welcome to apply online. However, they must beat at least two current members for a chance to join the club. All members must follow the rules of the fight club. One way to bypass the application process is to attend an Open Session where non-members can train with each other until they are spotted by a member. Some players reach the required standard through continuous training at the Open Sessions. These sessions are coached and supervised by a full member, and currently take place most Fridays, Saturdays, and Sundays at our King’s Cross venue and on Wednesday nights at our Marylebone venue. Check the events calendar for more details including prices and bookings. The club has three venues in central London: in Marylebone (NW1), King’s Cross (NW1) and during spring/summer, Southwark (SE1). See our map below. Founded in 2014 by Georges Sokol (aka Maverick) and sponsored by Decathlon, the club offers a unique opportunity for table tennis players of a high standard to ‘fight’ with one another. The first aim of the club is to enable its members to achieve their peak potential. Our members have the motivation to train, compete, and attain a high level of performance. 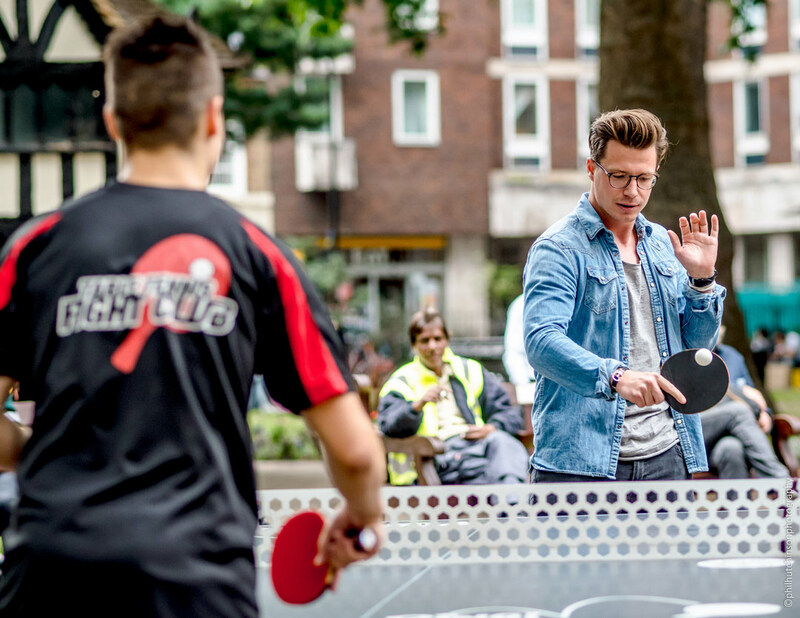 The club also encourages its members to promote table tennis to the general public by playing and participating in community projects. Although our members like to fight and win, they show good sportsmanship at all times. They are independent thinkers who value initiative and self-direction. They tend to challenge assumptions about the game and life, while respecting the views of others. Members have no role models, but seek to become their own hero. YOU DON’T HAVE TO BE A MEMBER TO PLAY. Anyone can book an Open Session. 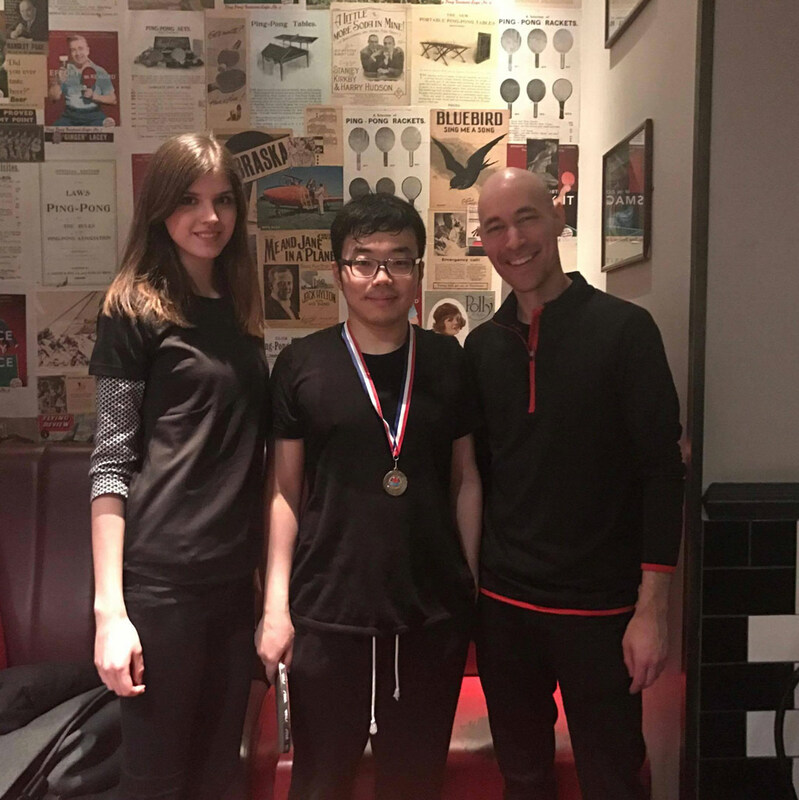 However, if you have been recruited by an existing member, email membership@tabletennisfightclub.com with the name of the person who put you forward and you will be invited to a free session. If you have not been recommended, click here to book an Open Session. Or if you feel you already have the requisite playing level and personality, fill in our application form to be considered for an invitation. The committee will then assess your submission and decide whether you get invited to a session. To become a fully-fledged member, you will need to prove your worth by defeating two current full members in a best-of-five games playoff (this holds true whether you’ve been invited or recommended). You can challenge members at any official TTFC event and as many times as you like, provided the members agree. The Open Sessions currently take place in Marylebone most Wednesdays 8pm-10pm, and in King’s Cross on Fridays 7pm-9pm, Saturdays 3pm-5pm, and Sundays 5pm-7pm. The members-only sessions are hidden from public view in our events calendar. See map below. There are sessions 3 times per week at the Somers Town Sports Centre, 134 Chalton Street, NW1 1RX (Google Map). On Wednesday nights, we have sessions at the Greenhouse Centre, 88 Bell Street, NW1 6SP (Google Map). And during spring & summer, some Open Sessions are held at 49 Tanner Street, London SE1 3PL (Google Map), Full members can arrange to fight at our other secret venues, which are only revealed once a player receives a formal invitation to join. As well as having access to a network of skilled players, members’ perks include discounted sessions, a TTFC t-shirt, and business cards. 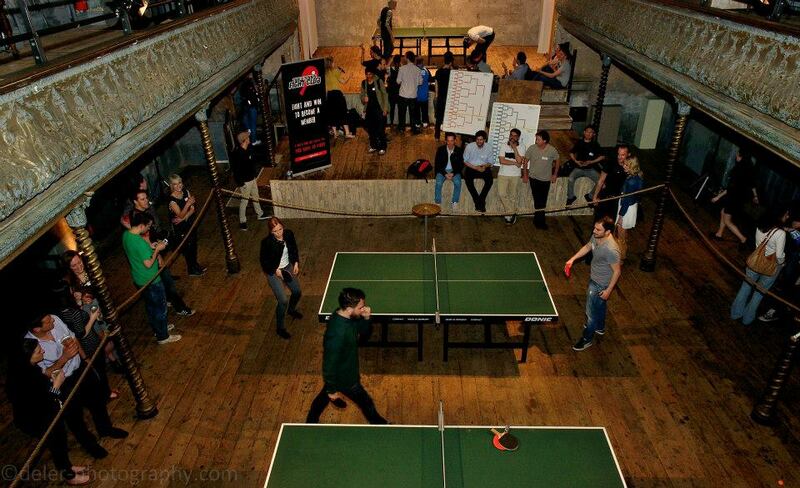 We also take part in tournaments and host monthly social events for our members. 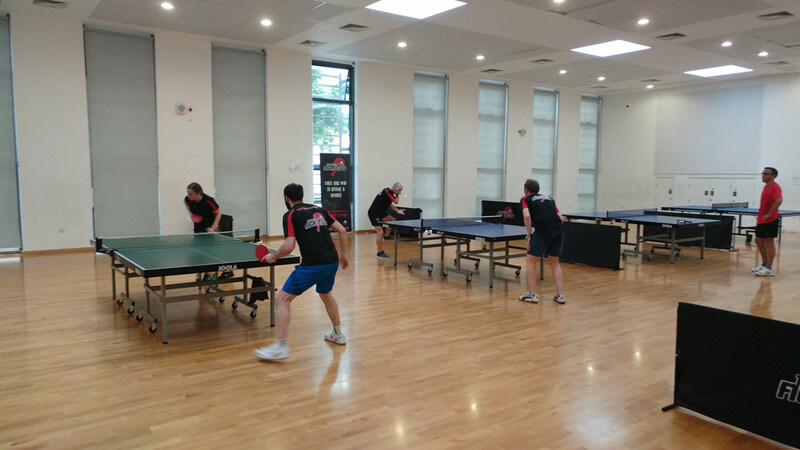 We have a team in the British League and several teams in the central London league where we play weekly against other clubs in London from October to March.